Synopsis: Actually, it's for any vehicle with a third brake light and any driver who wants to warn tailgating drivers! These Brake Light Pulsar with SmartPulse units will briefly flash your third center brake light after you apply your brakes and then the brake light will remain on without flashing as long as your brake lights are on. 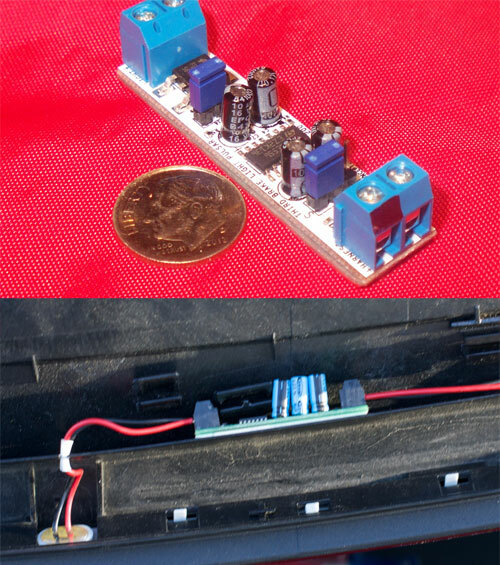 Using surface mount technology, this little unit was designed to be as small as possible and fits nicely into the third brake light cavity. This generation has been designed to handle all brake light fixtures. It can be used on either LED lights or incandescent bulb lights and is still very small, easily fitting into the MINI. The now revised Pulsar allows you to select Long or Short pulse duration during installation by moving the jumper by the S and L. The Short setting pulses the light about 6 times while the Long setting pulses it about 10 times. After getting many requests from owners who live in high stop and go traffic areas, 'Go MINI Go' developed the second generation PULSAR with SmartPulse technology. When in stop and go traffic, SmartPulse will stop the third brake light from pulsating. When you hold your brake pedal down for more than 12 seconds and then reapply your brake within 9 seconds, this unit will not pulse the third brake light. It will come on solid. When you reapply your brakes after 12 seconds, the unit will pulse your third brake light again. If you do not wish to have the SmartPulse enabled, simply remove the jumper at J4 and the unit will behave like a Gen 1 PULSAR. Fits any make and model vehicle.